Steam the potatoes in their skins for 30 minutes. Peel them using a knife and fork. Chop with a knife before mashing. Mash thoroughly to remove all the lumps. Add 1 stick of butter in pieces. Gradually add hot milk, stirring all the time. Season with a few grinds of black pepper. Boil the cabbage in unsalted water until it turns a darker color. Add 2 tablespoons butter to tenderize it. Cover with lid for 2 minutes. Drain thoroughly before returning it to the pan. Chop into small pieces. Put the ham in a large saucepan and cover with water. Bring to the boil and simmer for 45 minutes until tender. Drain. Remove any fat and chop into small pieces. 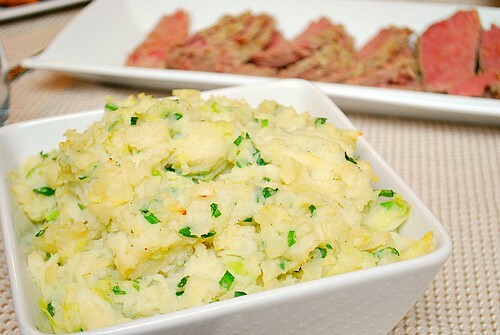 Add cabbage, scallions, and ham to mashed potatoes, stirring them in gently. Serve in individual soup plates. Make an indentation on the top by swirling a wooden spoon. Put 1 tablespoon of butter into each indentation. Sprinkle with parsley. I just finished cooking colcannon. But I use bacon instead of ham, and then cook the cabbage in the bacon fat.